Chief operating officer Ali Russell and Gordon Smith, director of football, confirmed they are leaving their roles. Rangers have announced the departure of two high-profile executives at the club. Chief operating officer Ali Russell and Gordon Smith, director of football, stood down from their roles. Former player Mr Smith said he was "undermined" through his association with owner Mr Whyte. The redundancies are among the first that administrators Duff and Phelps have made since being appointed last week. He added: "I admit that under the current circumstances it has not come as a major surprise to me. I was brought in by Craig Whyte but because his control and reputation has been damaged by recent disclosures, I feel my own position has been undermined by association. "However, I would make the point that I was very frustrated in my job as I was unable to fulfil the job specification which was originally outlined for me. "This was to control the major aspects of the football department outwith the first team operations. These were to include recruitment, scouting, transfer negotiations and youth development. I wasn't in control of any of these activities despite constantly making it clear to Craig Whyte that this was to be my remit. I outlined my medium to long term strategies for the Club on numerous occasions to no avail. There's no point in being a Director of Football unless you can control these areas, so, in that respect I'm totally comfortable with being made redundant at this time." The pair will continue in their positions at the Ibrox club until the end of the month. They are the first employees to be made redundant at Rangers since administrators were called in. Paul Clark, joint administrator, said: "Administrators met Ali and Gordon and during the meetings they expressed their deep disappointment regarding the position in which the club has been placed. There is nothing to suggest that either of them did anything but strive to act in the best interests of Rangers Football Club during their terms of office. "At our request, both agreed to stay on and assist the club until the end of this month and we are very grateful for their co-operation and willingness to do what they can during this difficult period for Rangers. Meetings have also been held with Ally McCoist and we had discussions regarding the potential impact of the administration process on the football department and we will continue to consult fully with him. "It is clearly understood by all, including the players, that the football department costs will come under review as is the case with all departments within the business. No decisions regarding staffing in any department have been taken at this point and will not be taken until next week." Both of Mr Russell and Mr Smith were appointed by owner Mr Whyte last June. After leaving his post, Mr Russell said: "It has been a great honour to have worked for Rangers Football Club. I only wish the circumstances could have been better. 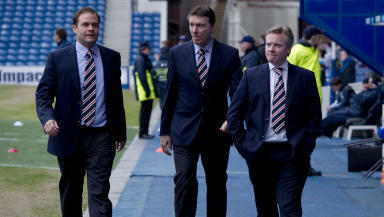 I would like to offer special thanks to Ally McCoist and Gordon Smith who have been tremendous throughout all of this. "This is a difficult time for Rangers and I hope my departure will help others keep their jobs. The most important thing in this whole saga is the club’s future is secured and Rangers looks forward to better days. I am sure that will happen and my support will always be there for the club." The announcement from Duff and Phelps comes as administrators handed over information on the financial situation at the club to Strathclyde Police. Administrators were brought in after HM Revenue and Customs went to the Court of Session to appoint insolvency experts over unpaid PAYE and VAT from Craig Whyte’s May 2011 takeover totalling £9m. Joint administrators Paul Clark and David Whitehouse have claimed that redundancies at the crisis-hit club are not a foregone conclusion. Manager Ally McCoist also previously said he hoped the administration process would be as painless as possible.